Skoda is expected to unveil the 2015 Fabia hatchback at this year’s Paris Motor Show. The car will go on sale internationally from the beginning of 2015 and is expected to come to India sometime next year. The 2015 Fabia will not adopt the Volkswagen group’s MQB platform but will continue using the PQ25 platform of the outgoing model. 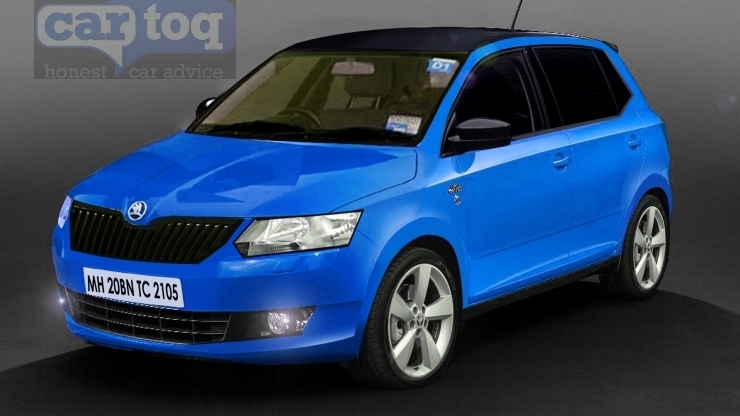 CarToq has rendered the 2015 Fabia hatchback, which is likely to adopt the Czech car maker’s latest design philosophy that is seen on the likes of the Octavia and the Rapid. The 2015 Fabia will be more of a design evolution of the outgoing model than a radically new car. The hatchback will gain turbo petrol and turbo diesel engines. While the 1.4 liter-3 cylinder TDI turbo diesel engine, first introduced on the 2015 Polo facelift, will be the major new engine on the international Fabia, the Indian version is likely to get a 1.5 liter-4 cylinder TDI engine, a downsized version of the 1.6 liter TDI motor. The car sold internationally will also gain a 1 liter-3 cylinder TSI engine, which replaces the 1.2 liter MPI-naturally aspirated petrol motor. Manual and automati gearboxes will be offered on the car. Since the 2015 Fabia will be the Czech brand’s entry level offering, the focus will be on attracting younger buyers. To that effect, Skoda is said to be adding a new range of connectivity option and features that are aimed at younger buyers. Expect the 2015 Fabia to feature new interiors and segment leading connectivity features. The new car is expected to retain the sure footed handling dynamics and the solid build quality of its predecessor. In the Indian context, the 2015 Fabia will be Skoda’s latest chance at getting a foothold in the volumes game. Skoda has not been faring well in India. The Rapid is losing steam in the C-Segment sedan space while the Octavia is turning out to be an average seller. The Superb Facelift and Yeti Facelifts can only do so much to pep up Brand Skoda here. Therefore, a well priced and finely spec-ed 2015 Fabia could be the next big thing for the Czech car maker.